A ramen place in Shinjuku (technically Yoyogi, Shibuya-ku) where always people are lining up. Sometimes only in front of the shop but also I've seen people are in a line on the other side of the ramen shop. The ramen shop is facing to a road and on occasion, cars are coming through, so basically the line is cut by the road then people start making a line in a park nearby. When we got there, there're 5-6 people were waiting before the door, but there're another line inside. Total waiting time (outside + inside) was about 30 minutes. Fu-unji only provides ramen and tsuke-men (dipping noodles; noodle and soup are served separately and you pick up some noodles and dunk them into the soup to eat. Usually the soup is thick so that it can easily cover and stay on the noodle). And once people finish the bowl, they leave without resting or chatting there, which is nice. When you enter the place, there's a vending machine to buy tickets for ramen. However, the machine doesn't have any photo or definition what is what. It seemed like as if everyone knew about their ramen (even though it's not their intention) and I thought it was really inconvenient to see the difference between regular ramen and special one. When you get close to the head of the line, the waiter or waitress asks you to give him/her your ticket and make sure the order and also the amount of the noodle. You can choose either normal amount or extra noodle without paying the difference. I ordered special one and compared with the regular ramen. Special ramen has an extra slice of char siu (Chinese-style barbecued pork). The soup looked almost the same as Tonkotsu (pork bone broth soup) but it didn't have any strong and distinct flavor so that the shop didn't smell. Even though the appearance of the soup is thick and heavy, it's just the way it seemed and it wasn't as heavy as the fatty pork bone broth. I could smell the fish dashi (broth) in the end and the soup didn't stick in my mouth and went down easily and quickly leaving a slight scent of all the broth. 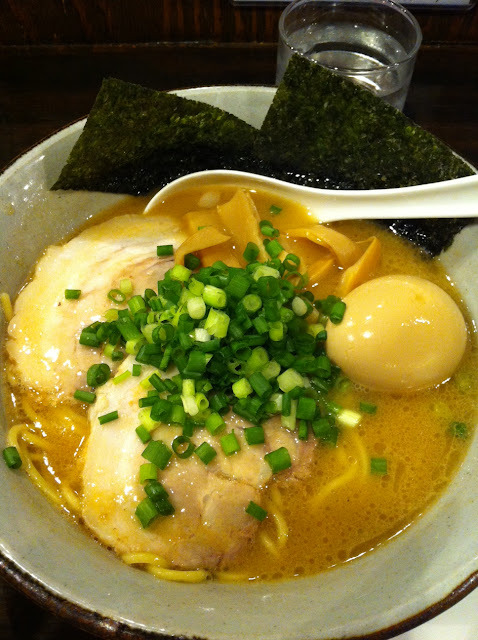 According to the HP, the soup is not Tonkotsu (pork bone broth) and it's thick chicken and fish soup. The soup is made with whole chicken, chicken stock, dried kelp, dried bonito (from Kochi prefecture), dried sardines (from Ehime prefecture) and others. To make the soup, they slow-cook them for 8 hours, then strain is for 6 hours, and mature the soup for one day. The noodle was medium thickness; not too thick but not too thin. It looked like a square and slightly yellow. Not only due to the thickness of the noodle, but also they prepare the noodle slightly al dente but the noodle itself was smooth. As the noodle is thick, it could catch the rich soup really well. Green onion was fresh and provided different texture to the soup and noodle. Mianma (bamboo shoots) was something ordinary. Nori (sea weed) was normal nori. 15 seats at the counter are available (no table inside). Black table with medium height chairs. Person in front of us was single, we were a group of 2, and person behind us was solo. And the counter had 1 seat available, but the waiters kept the order of the line and didn't skip us. Once two seats are open, they guided us to the space.